A naked man who rampaged through a Portrush hotel spraying a fire extinguisher whilst headbutting room doors was standing at the entrance with just his socks on when police arrived. 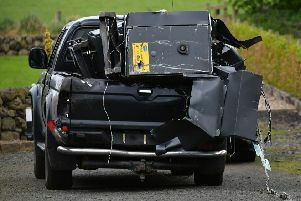 Harley Alex Floyd McHenry (25), of Russellstown Road near Galgorm, caused so much “mayhem” disgusted guests were reimbursed by the Magherabuoy House Hotel, Coleraine Magistrates Court was told on Monday. McHenry previously pleaded guilty to five charges arising out of the March 19 incident. As well as being disorderly at the hotel, he caused criminal damage to a lamp and fire extinguisher and also admitted two charges of assaulting police and one of attempted criminal damage to a police car window. Police were called on Sunday March 19 this year to a report a naked male causing a disturbance. A prosecutor said noise was coming from Room 317 and a naked McHenry headbutted doors and went into a store causing damage. He then ran down a fire escape when told police were coming. The prosecutor said countless complaints were received from residents with children were who were “extremely upset” and when police arrived McHenry was at the hotel entrance, naked except for a pair of socks and a hoodie over his shoulder. Police noticed he had a bump on his head and was carrying a broken fire extinguisher. He kicked and tried to bite a police officer and when arrested kicked a window of a police car. A cell van had to be called and he headbutted the inside of it. The prosecutor said during an interview McHenry said he couldn’t remember what he had done but accepted what he was being told and apologised. The hotel had to reimburse £800 to guests because of what they experienced on the night in question. Defence barrister Michael Smyth said the circumstances were “bizarre” and explained McHenry had visited the hotel with his partner and after having a meal and a couple of glasses of wine during the evening, when the woman had gone to sleep, McHenry downed a ten glass bottle of vodka. Added Mr Smyth: “He was wandering about the halls of the hotel naked with some bizarre lack of understanding of what was going on”. Mr Smyth said his client headbutted doors and discharged a fire extinguisher and McHenry’s partner was unaware of what was going on until the defendant was taken away by police. Mr Smyth said McHenry could not recall what he had one and said there are “two” Harley McHenry’s, one work works hard and another who takes copious amounts of alcohol and loses control of himself. Jailing McHenry for six months, District Judge Peter King told him he had “caused mayhem” and said what he had done would have been bad enough if he had been “clothed”. The judge said after having a pleasant evening with his partner he had no idea why McHenry then “decided to neck a ten glass bottle of vodka”. Bail for appeal was fixed on the sum of £500 with a condition that the defendant does not return to the Magherabuoy House Hotel.